We hold a lot of stress and tension in our faces and our faces are exposed to the elements all day long. Yet, our faces are what others notice first about us. Let the day spa experts at The Floating Lotus melt away the worries of the day with a cleansing, relaxing facial treatment. You’ll float out the door fresh-faced and revitalized! Microdermabrasion is a noninvasive, skin resurfacing procedure that gently exfoliates the top layer of skin cells, while stimulating collagen growth. This reveals healthy skin that looks and feels smoother. The face is cleansed, then exfoliated using a crystal-free diamond tip. A treatment masque is applied and sets while you relax with an upper-body massage. This treatment begins with a deep cleansing and microdermabrasion of the face. Once the skin has been dried, a light peel is applied. Next, a treatment masque is massaged into the face with lymphatic drainage movements. Finally, we apply a healing serum and a nourishing moisturizer, which penetrates the top layers by use of an ultrasound machine. A quick, no-frills version of our Microdermabrasion Facial. Get all of the benefits of microdermabrasion in lunch break-friendly time. Your skin will be cleansed and deeply exfoliated. A calming masque will be massaged into the skin, then a serum and a sunscreen will be applied. Suitable for both men and women, LED therapy is a noninvasive light-therapy treatment that reduces the appearance of the visible signs of skin aging. It promotes collagen production, increases oxygenation and helps heal acne. After cleansing and exfoliation, an ultrasound current provides a deep moisturizing treatment that stimulates collagen growth. Studies have shown that a series of six ultrasound facials will stimulate a 30% increase in collagen in most patients. 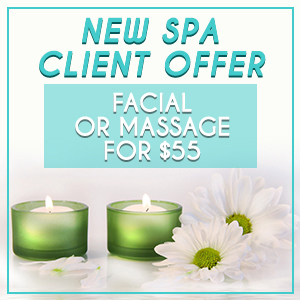 You’ll leave the spa with youthful, glowing skin. A positively stimulating facial! Fresh apple and grape pulp infuse natural fruit acids into the skin while paprika stimulates circulation and detoxifies, resulting in a fantastic organic exfoliation. To finish, cooling masques and moisturizers suiting your skin type are applied. A fresh take on skin care! Completely customized for your skin type and concerns, this treatment will revitalize and rejuvenate your skin. Skin is refreshed and balanced, while remaining free of parabens and harsh chemicals. Mother Nature would approve. This facial uses organic products especially geared to the demands of a man’s skin. In addition to deep cleansing of the face and neck, steamed towels open pores and create a relaxing sensation. The experience concludes with a face, neck and hand massage using non-perfumed, non-greasy moisturizers. You’ll leave feeling like a new man! Bring radiance to even the dullest skin! Your esthetician will use one of our Skin Therapeutics chemical peels to exfoliate your skin without unnecessary irritation, infuse skin with rich vitamins and moisturize. Choose from a variety of natural, plant-based peels that will accelerate the exfoliation process, revealing bright, fresh skin. These effective peels help reduce fine lines, pigmentation and sun damage. Experience Mother Nature at her best. The stimulating, exotic spices and fruits of this treatment increase circulation and exfoliate dry skin, leaving it smooth and detoxified inside and out. A hand and arm massage will soothe your cares away. Customized for all skin types. Add any of these to your facial treatment for an enhanced experience. Love the look of eyelash extensions, but prefer the feel of something more natural? Our lash lift and tint will give you just that. Enhance your eyes beautifully, with lifted, tinted and fuller-looking lashes. No more eyelash curler, and you can even go mascara-free. Typically lasts 2-3 months.